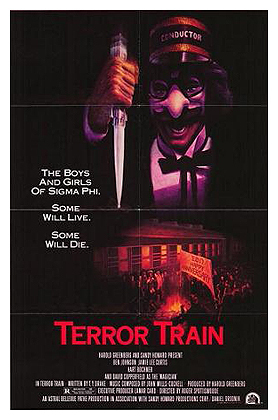 Terror Train is another of the more fondly remembered of the 80s slashers, but mostly because it stars horror queen Jaime Lee Curtis who was having a banner horror year in 1980 with The Fog, Prom Night and this Canadian fright flick. Though despite it’s novel setting, I actually think this is one of the duller of the major horrors of the early 80s and was never a really big fan of it. A recent revisit hasn’t changed my mind. The film opens with a fraternity/sorority New Years Eve party for a bunch of pre-med students and like most slashers, involves a prank gone horribly wrong. Pretty Alana (Jaime Lee Curtis) lures shy and dorky Kenny (Derek MacKinnon) up to her room where unknown to both of them, a medical cadaver waits for him in her bed. Kenny has a breakdown as the horrified Alana looks on and the poor student is shipped off to a mental hospital. Three years later Alana is still heartbroken over her role in the incident, but her boyfriend Mo (Timothy Webber) and jerk frat leader Doc (Hart Bochner), who were involved in the original prank, have organized another NYE masquerade party on an old train that will travel through a remote mountain area as they ring in the new year. As we see one partier already dead by the side of the tracks as the train leaves, we know not everyone will be alive by the journey’s end. Who…like it’s hard to figure out…is on the train with murder on their mind? Terror Train is directed by Roger Spottiswoode who went on to direct the James Bond film Tomorrow Never Dies almost 2 decades later and we wish he would have given this film some of the energy and excitement of his 007 flick. 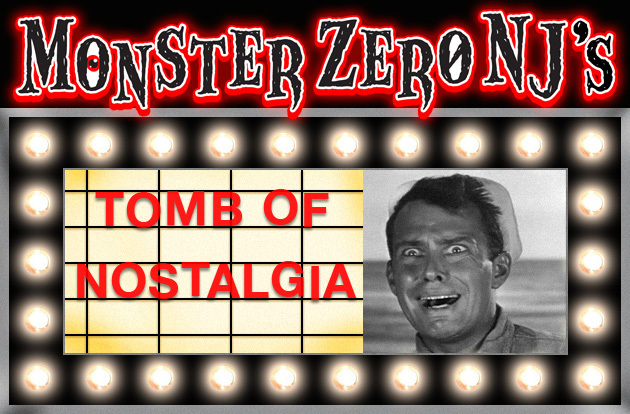 While I understand that a lot of horror films at this time had a more moderate, slow boil pace…which is fine with me as I came of age at this time and these were the horror flicks I was weened on as a teenager…but Terror Train seems especially slow moving and lethargic even by those standards. The film never really makes good use of the confined and remote setting of the moving train, nor does much with the plot device of the killer utilizing his victim’s costumes to move around unnoticed. After all, we see them die, so we know right away who it is when their costume reappears, so it’s not all that suspenseful or clever. Most of the kills happen off camera and while there is certainly some blood, it is rather routine and nothing we haven’t seen in any number of horror flicks. There is also very little suspense as we really never get to know any of the costumed victims very well and have little emotional investment in their wellbeing and they are just that, victims. Also, aside from Spottiswoode’s failure to make this 90 minute flick feel less then at least two hours, the film stops dead for scenes of a mysterious and creepy magician (real-life illusionist David Copperfield) doing his act. I understand it’s part of the plot as the magician is a suspect, but it’s obvious the filmmakers are trying to get the most out of their celebrity guest star. The film does pick up a bit in the last act as Curtis finally becomes the target and is hunted through the train, fighting back against her assailant, but when we get to the reveal/finale, it is really no surprise as we are given few suspects and one character is obviously not who they appear to be when we see them. This plot element also defies logic as the killer already got onto the train wearing a victim’s costume, so why then take up another identity that put’s them in plain sight? Going from costume to costume should have worked just fine on a train full of drunk college kids. The cast really doesn’t help matters either or the director just failed to inspire them. Curtis doesn’t show the pep and fire she had in Halloween Or The Fog. She’s performing on a paycheck level and only perks up when she has to for the climactic scenes when she is being chased. Otherwise she doesn’t really seem like she wants to be there and as this was her third horror role in one year, she was probably getting tired of the typecasting at this point and it shows. Veteran actor Ben Johnson is solid as the conductor who realizes something is very wrong on his train and breathes a little life into his part. As for the rest, everyone is pretty bland and none of the character’s rise above the college student/victims that they are. At least non-actor Copperfield is basically playing himself and created all the illusions for the film and seems to be a trooper in his part as a creepy suspect…which also makes no sense as they start to believe he’s ‘Kenny’ and they should know what Kenny looks like, he was a fellow student till they drove him nuts. There is some 80s nostalgia added to the flick now and I am very sentimental about this era because, it was when I was finally old enough to go see this flicks and saw so many on a big screen, where movies like this should be seen. It still doesn’t really save this film for me as it is just very slow moving and un-involving and considering the premise, should have been so much more than an incredibly average at best slasher flick. I still feel, though, that if someone is looking to familiarize themselves with the horror films of this great era for horror movies, that this is still one they should watch, but I am not a fan and it is not one of the films from this time that I hold dear.